You've just signed your wedding photography contract, put your trust in someone you possibly just met, and are spending thousands of dollars on a product you seeminly have little control over. That is a lot of commitment, so how do you know you're getting the most value out of your hired photographer? Your photographer knows others that do great work in the industry. If you're in need of vendor recommendations, just ask them. They will happily refer you to people they trust and have worked well with before. If you want a second opinion on an idea, or the timing of events, ask away! Your photographer has been to many more weddings than the average person and they know what's a for sure hit, and what generally flops. Weddings are known for running late but the more you can stick to the timeline you and your photographer set up the more time you’ll have for photos. 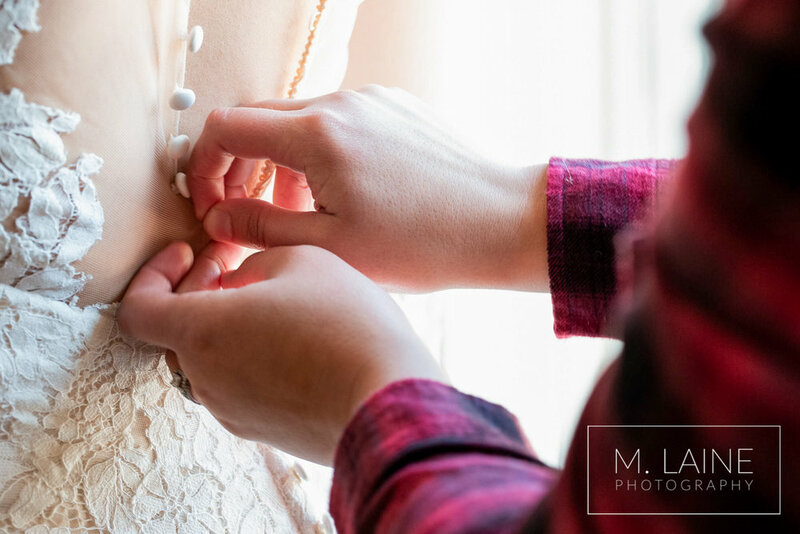 The most common reason my own brides get behind schedule on wedding days? Hair and makeup takes longer than expected. Fix this by doing a trail run, and time how long it takes. Then schedule them for the day of with ample time to finish. Speaking of hair and makeup, treat yourself and hire professionals! They know the tricks of the trade to make your hair and makeup stay looking great ALL day. You’ll feel like a bombshell looking back through your photos and noticing that your hair looked just as amazing as you were exiting your reception as it did during your ceremony. It’s well worth a splurge to look glamourous into the evening! If your photographer has to spend time traveling between locations such as a hair salon, wedding venue, first look location, then back to the venue on your wedding day, you're paying them to travel during that time, not photograph. Weddings that have the portraits, ceremony, and reception all in one place will get you the most bang for your buck. If you have an idea for a photo, or really appreciate a background at your venue, please tell your photographer, otherwise there is no need to stress about where to take photos. Your photographer will be sure to scout out your venue on the day of your wedding for their preferred lighting and backgrounds. A great photographer can make any location look awesome since beautiful images are 90% about lighting. Halley and Braden’s wedding day portraits (below) were taken in harsh mid-day light — tough shooting conditions — and their portraits still turned out gorgeous. A wedding planner takes care of the schedule, timing, wrangling family, and so on. They do it ALL which allows your photographer to focus on giving you their full creativity. With a wedding planner, your photographer will have more time to photograph, the day will run smoother and you’ll stress less. Everyone wins! Adding an engagement session to your photography package allows you to see how you and your photographer work together, before the big day. Think of it as a test run. You’ll get a feel for how your photographer asks you to pose, see how your hair holds up after a bit of shooting, and bonus — you now have guestbook and save the date material. On your wedding day, the last thing you want to be concerned with is how you’re appearing in photos. With an amazing engagement session already done, you’ll know you can full heartedly trust your photographer and focus on the things that really matter. Yes, it's possible to make a wedding album yourself, but this is not the time for a DIY project. You just spent thousands on your wedding photos and thousands more on the wedding. Buy an album that accurately reflects the beauty of your day. Photographers have tons of practice making albums, so they know the best designs, flow and products. They also have access to top of the line products that will last for generations. If you're spending money on wedding photography make sure you have something to show for it afterwards.